I recently had a daytime, sick day double feature. A rare treat for an active Father of two. I fired up Amazon Prime and went through my list and was happy to see that HELL HOUSE LLC was and top of my list. I snuggled in and settled in for the viewing. 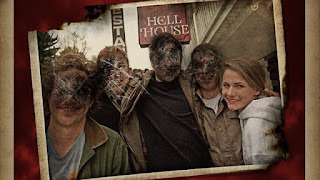 Hell House LLC is a found footage film that documents the strange goings on in an abandoned hotel as a group of 20-somethings build out a haunted house attraction. "Five years after an unexplained malfunction causes the death of 15 tour-goers and staff on the opening night of a Halloween haunted house tour, a documentary crew travels back to the scene of the tragedy to find out what really happened." I loved the storytelling here. You see the horrific outcome via some footage that was posted to YouTube and some interviews speaking about the events gravely, but you don't know what happened other than something went very wrong and people died. 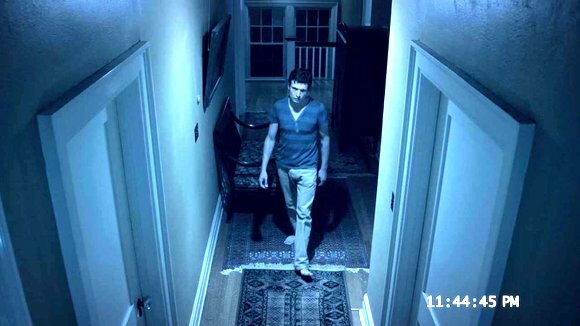 When additional footage is recovered, the tale unfolds in classic, found footage style. The acting felt real and the relationships seemed honest which really helped to sell the whole story. The fact that GoPro camera's where mounted as a safety precaution for the haunt nights sold the reason why they had so much good footage. And, documenting the haunt build for future advertising and the like made constant taping understandable. I'm not usually a found footage fan, but this one was super solid and didn't bother me at all. The storytelling was the thing that really locked it in for me. We're right there in the thick of the story, investigating along with the people in the movie to try and sort out what happened. Clues drift into place as the movie rolls along and you twist and turn along with it as opening night looms ahead. I have not felt the same way about a film like this since I originally caught The Blair Witch Project when it came out in the theater or when I curled up with Lake Mungo for the first time. I was completely invested in the film, story, and characters. 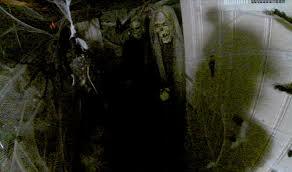 All in all, Hell House LLC had a fun story with some grand scares and chills. It is a new Halloween Fave for me that I plan to own very soon! I loved it. A fantastic first feature length film for Director Stephen Cognetti. I can't wait to see more! Now, I usually don't bash films if I didn't enjoy them taking the tack of, "If you don't have something nice to say, don't say anything at all." But, seeing as this came on the heels of Hell House LLC, it was an interesting juxtaposition of what works and what doesn't that might be beneficial to filmmakers. This was Kathleen Behun's first feature as well and I'm looking forward to see what she does in the future. I would assume that a found footage feature might be a bit easier to do as a first film with a smaller budget - especially when you only have three people in one location, but it might have other limitations for sure. Juggling time between three people in a house requires some careful planning. I think she pulled that off along with making the single location interesting and engaging. 21 Days tells the tale of a house that people can't last more than 21 days in. Things are so disturbing within the house that occupants usually end up fleeing - leaving all their belongings behind, and if they don't, they go mad. 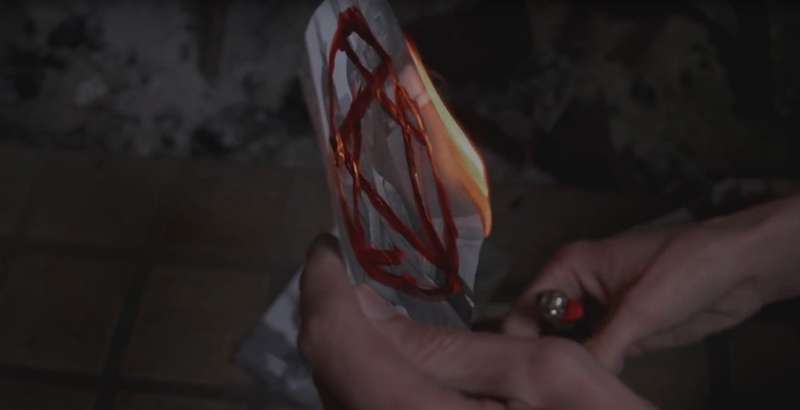 "Three filmmakers embark on a paranormal challenge by barricading themselves in a house so haunted, no one has been able to live in for more than 21 days." The house had an interesting lore behind it. The movie had all the usual scary tropes in there as well. Things in mirror reflections, doors slamming, stuff appearing....the usual. But, there were a few things that 21 Days had that grated on my nerves a bit. 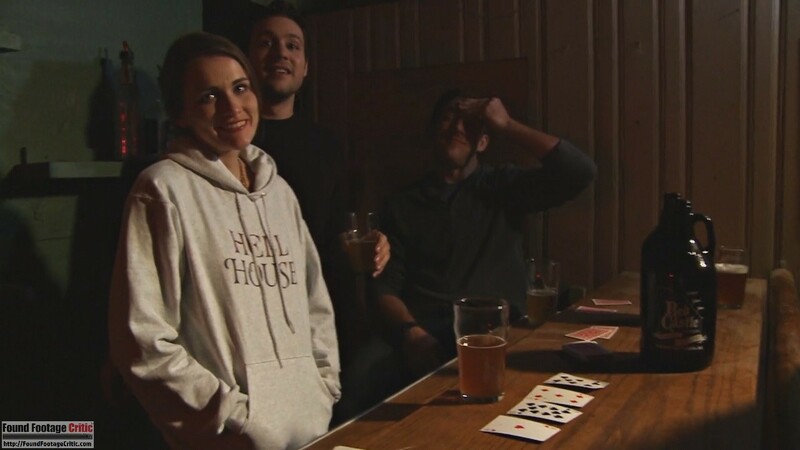 The acting and writing were not at the same level as Hell House LLC, which instantly took me a little further away from what was going on. 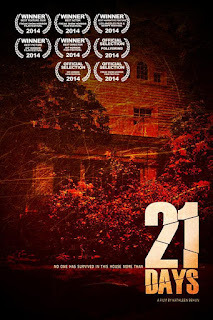 While LLC had a documentary feel that was super strong, 21 Days felt like a movie made to scare. Not that there's anything wrong with that. It did have a Paranormal Activity aura around it. I jokingly put of a tweet while watching the third act that said, "The last 21 minutes of 21 Days was filled with shaking cameras, screaming, and darkness." Up to this point, things were relatively forgivable, but even my wife said, "God...that woman just keeps screaming frantically. I hate that," as she was walking through the room. The panic in LLC seemed genuine and the fact that there was a huge crowd involved really helped to set the scene at it's finale. But, 21 Days only had three people bottled in a house. They tried to have emotional spikes and heated interactions (handled expertly in LLC), but they just came off as script readings when all is said and done. Now, don't get me wrong - there are some cool things in 21 Days as well that I'm sure will freak out someone in the mood for a haunted house flick. The scenes that took more time and subtlety played out really well and had me looking for little nuggets here and there on the edges of the screen. However, the film's final act crumbles into camera's being carried around by running people and he house becoming darker and darker until at one point there's a solid black screen with someone talking. The scene brightens a bit to reveal the big finish and there's a fun post credit scene, but I wish they had found some way to avoid the shaking cameras and screaming a bit. At one point, someone is even filming with their iPhone and they drop it in a panic. The phone drops, but it's almost like they've placed it on the floor. And, the framing is set perfectly when it's dropped - spot on for catching the same character running to the door and banging on it to be let out. Have you ever tried to place your camera somewhere to get a family photo on a timer? It's usually SUPER hard to find somewhere that a camera can be placed for the shot. Yet this person drops the phone and gets the perfect framing? That's the kinda thing that completely removes me, but that I can see someone else not even thinking about. But, all of this might have been different if I didn't finish Hell House LLC minutes before. I also think it isn't played for someone like me - 48 with WAY too many horror movies under my belt. I'm sure this film was a hoot for a younger crowd who are a lot less jaded about horror. I think I owe this film a re-watch. Both of these should be added to your Halloween viewing list!